"Intercontinental Airport" redirects here. For other such airports, see international airport. George Bush Intercontinental Airport, (IATA: IAH, ICAO: KIAH, FAA LID: IAH) is an international airport in Houston, Texas, United States, under class B airspace, serving the Greater Houston metropolitan area, the fifth-largest metropolitan area in the United States. Located about 23 miles (37 km) north of Downtown Houston, between Interstate 45 and Interstate 69/U.S. Highway 59 with direct access to the Hardy Toll Road expressway, George Bush Intercontinental Airport has scheduled flights to a large number of domestic and international destinations. 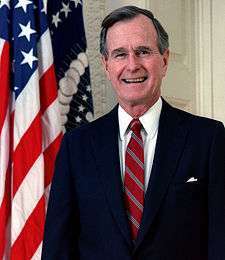 The airport is named after George H. W. Bush, the 41st President of the United States. George Bush Intercontinental Airport served 40,187,442 passengers in 2011 making the airport the tenth busiest for total passengers in North America. In 2006, the airport was named the fastest-growing of the top ten airports into the United States by the United States Department of Transportation. Houston Bush Intercontinental is the largest passenger hub for United Airlines enplaning 16.6 million passengers annually with an average of 45,413 passengers daily. The airport also serves as a focus city for Spirit Airlines. Under operations as United Express, Expressjet Airlines and Skywest Airlines operate hub operations from IAH. During the 1970s and early 1980s, Intercontinental served as focus city for several major airlines including the original Braniff International Airways, Delta, Eastern, National, and Pan Am. IAH was the premier domestic and international hub for Continental Airlines prior to its merger with United Airlines and also served as a hub for Houston-based Texas International Airlines and commuter air carrier Metro Airlines which was also based in the Houston area and started its first flights when Intercontinental opened in 1969. The site for Bush Intercontinental Airport was originally purchased by a group of Houston businessmen in 1957 to preserve the site until the city of Houston could formulate a plan for a new airport as a replacement for what was then known as Houston Municipal Airport (later renamed William P. Hobby Airport). The holding company for the land was named the Jet Era Ranch Corporation, but a typographical error transformed the words "Jet Era" into "Jetero" and the airport site subsequently became known as the Jetero airport site. Although the name Jetero was no longer used in official planning documents after 1961, the eastern entrance to the airport was named Jetero Boulevard. Most of Jetero Boulevard was subsequently renamed Will Clayton Parkway. The City of Houston annexed the Intercontinental Airport area in 1965. This annexation, along with the 1965 annexations of the Bayport area, the Fondren Road area, and an area west of Sharpstown, resulted in a total gain of 51,251 acres (20,741 ha) of land for the city limits. Houston Intercontinental Airport, which was the original name for IAH, opened in June 1969. All scheduled passenger airline service formerly operated from William P. Hobby Airport moved to Intercontinental upon the airport's completion. Hobby remained open as a general aviation airport and was once again used for scheduled passenger airline flights two years later when Southwest Airlines initiated intrastate jet service between Hobby and Dallas Love Field in 1971. Houston Intercontinental had been scheduled to open in 1967, but design changes regarding the terminals created cost overruns and construction delays. The prime contractor, R.F. Ball Construction of San Antonio, sued the city of Houston for $11 million in damages, but assistant city attorney Joseph Guy Rollins, Jr. successfully defended the municipality on appeal to the Texas Supreme Court. In the late 1980s, Houston City Council considered a plan to rename the airport after Mickey Leland—an African-American U.S. Congressman who died in an aviation accident in Ethiopia. Instead of renaming the whole airport, the city named Mickey Leland International Arrivals Building, which would later become Mickey Leland Terminal D, after the congressman. In April 1997, Houston City Council unanimously voted to rename the airport George Bush Intercontinental Airport/Houston, after George H. W. Bush, the 41st President of the United States. On August 28, 1990, Continental Airlines agreed to build its maintenance center at George Bush Intercontinental Airport; Continental agreed to do so because the city of Houston agreed to provide city-owned land near the airport so that Continental could build its maintenance facility there. As of 2007, Terminals A and B remain from the original design of the airport. Lewis W. Cutrer Terminal C opened in 1981, the Mickey Leland International Arrivals Building (now called Terminal D) opened in May 1990, and the new Terminal E partially opened on June 3, 2003. The rest of Terminal E opened on January 7, 2004. Terminal D is the arrival point for all international flights arriving into Houston except for United flights, which use Terminal E. Terminal D also held customs and INS until the opening of the new Federal Inspection Service (FIS) building, completed on January 25, 2005. On January 7, 2009, a Continental Airlines Boeing 737-800 departing Bush Intercontinental was the first U.S. commercial jet to fly on a mix of conventional jet fuel and biofuel. 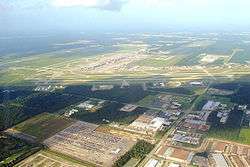 In December 2009 the Houston City Council approved a plan to allow Midway Cos. to develop 10 acres (4.0 ha) of land owned by Houston Airport System on the grounds of Bush Airport. Midway plans to develop a travel center for the airport's rental car facility. The city dictated that the developer needed to place a convenience store and gas station facility, a flight information board, a fast casual restaurant, and a sit-down restaurant. Beyond the required buildings, the developer plans to add an office facility between 20,000 and 40,000 square feet (1,900 and 3,700 m2) and additional retail; the developer may add a hotel. In 2011 Continental Airlines began Boeing 777-200 service to Lagos, Nigeria; this was the airport's first nonstop flight to the African continent although South African Airways had operated nonstop Boeing 747SP service in 1983 between Houston and Amilcar Cabral International Airport in the Cape Verde islands off the coast of Africa as a refueling stop for its flights between Houston and Johannesburg, South Africa. Continental successor United Airlines subsequently ceased nonstop service on the Houston-Lagos route. Continental was also planning to commence Boeing 787 service nonstop to Auckland but plans for the Auckland service were cancelled as a reaction to new international flights at Hobby Airport announced by Southwest Airlines. United Airlines—which acquired Continental and had fully integrated it into the United brand by early 2012—had postponed the introduction of this service owing to delays associated with the Boeing 787 Dreamliner. Its 787s were put to use on other international routes, however, including Houston-London and United's then new Houston-Lagos nonstop flights. The IAH-Auckland nonstop route was then begun by Air New Zealand using a Boeing 777-200ER. In 2014, United Airlines added a second daily flight to Tokyo, new routes to Munich, Germany, Santiago, Chile and Punta Cana, Dominican Republic and restarted the Aruba route (which had been canceled in 2012). Houston became the sixth U.S. city to have Airbus A380 service when Lufthansa transitioned its Houston-Frankfurt route from a Boeing 747-400 to an A380 service on August 1, 2012. On July 11, 2013, Air China began nonstop flights from Houston to Beijing-Capital using a Boeing 777-300ER. This is the airport's first nonstop route to mainland China. Houston also gained nonstop flights to Turkey when Turkish Airlines launched nonstop service to Istanbul-Atatürk on April 1, 2013. Korean Air commenced nonstop flights from Seoul-Incheon to Houston on May 2, 2014. Among other continental-Asia destinations, Singapore Airlines offers nonstop Boeing 777-300 service between Houston and Manchester, UK, with continuing, no change of plane service to its hub in Singapore; Qatar Airways flies a nonstop Houston-Doha route utilizing a Boeing 777-200; and Emirates flies nonstop from Houston to Dubai with the Airbus A380. On March 31, 2014, Scandinavian Airlines (SAS) announced that it would begin nonstop flights between Stavanger, Norway and Houston. This was the first time the airline had opened a route from one of its non-hub cities. The service was flown with a Boeing 737 BBJ operated by PrivatAir. The aircraft operated in SAS colors in a 44-seat all business class configuration. SAS subsequently ended this service on October 24, 2015. On April 24, 2014, Spirit Airlines announced new services from Houston to 6 new domestic destinations, including Atlanta, Fort Lauderdale, Kansas City, New Orleans and San Diego. In addition, Spirit added seasonal service between Houston and Minneapolis. These new flights bring their total destinations from Houston to 12 locations, which makes Spirit the second largest domestic airline by destinations at Houston's IAH, behind United Airlines. During September 2014, Spirit sought approval from the US Department of Transportation (DoT) to launch service from Houston Intercontinental to Managua, San José, San Pedro Sula, San Salvador, Cancún, San José del Cabo and Toluca. Spirit Airlines with the addition of the above-mentioned routes has increased Houston Intercontinental Airport's placement from the ninth largest focus city to the fifth largest focus city based upon the number of flights flown per week. Spirit Airlines experienced growth of 123% in weekly flight departures at Houston Intercontinental from August 2014 to August 2015. In 2014, Taiwan-based carrier EVA Air announced that it will launch nonstop flights from Houston to Taipei on June 19, 2015. This began initially with three flights a week on the 777-300ER. The frequency was increased to four times a week starting July 1, 2015, and to six times a week starting March 28, 2016. EVA Air plans to make these flights daily starting from the end of 2016. These flights leave Houston in the early morning about an hour past midnight. This marks the first time that actual nonstop flights are being operated between Taipei and any airport in Texas. In addition, All Nippon Airways also announced new 2015 service in 2014 from Narita International Airport. Flights on the 777-300ER began on June 12, 2015, with ANA becoming the first Japanese-based carrier to operate passenger flights into IAH. On June 19, 2014, Emirates announced that it would become the second operator of the Airbus A380 at Bush, upgrading its service from Dubai to Houston from a Boeing 777 to the "Super Jumbo" A380. Service began on December 3, 2014. On September 17, 2014, Frontier Airlines released that they would begin to base aircraft from Bush, for their new Phoenix–Sky Harbor and San Francisco services, with the possibility of more destinations from Houston to come in the future. In January 2015, United Airlines expressed interest in opening direct flights between Houston, and Havana, Cuba, after President Barack Obama originally announced the change in U.S. policy on Cuba on Dec. 17, as part of a larger deal that secured the release of Alan Gross, an American government subcontractor who was imprisoned on the island for five years. The flights are currently pending approval from the Department of Transportation. On July 16, 2015, the new Eastern Air Lines (2015) announced that it would begin a weekly service to Havana from Houston, in cooperation with HavanaAir Charters utilizing Boeing 737-800 aircraft, beginning on August 12, 2015. The service was announced to have been delayed as of August 11, 2015, with no announcement of a new date. On April 15, 2015, Air New Zealand announced that they would begin nonstop flights from Auckland to Houston with Boeing 777-200ER aircraft. Service began on December 15, 2015. George Bush Intercontinental Airport served 40,187,442 passengers in 2011 making the airport the 10th busiest for total passengers in North America. IAH is the 7th largest international passenger gateway in the US and the 7th busiest airport in the world for total aircraft movements. In 2006, the United States Department of Transportation named George Bush Intercontinental Airport the fastest growing of the top ten airports in the United States. The Houston Airport System (HAS) states that the airport's service area includes the following Greater Houston counties: Brazoria, Chambers, Fort Bend, Galveston, Harris, Liberty, Montgomery, and Waller. The airport currently ranks fourth in the United States for non-stop domestic and international service with 182 destinations and about 45 percent of the airport's passengers begin or terminate (O&D) their journey at the airport. 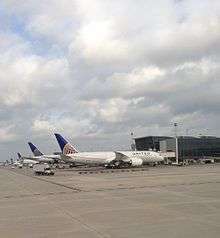 Bush Intercontinental ranks first among the major United States airports with the highest on-time performance, according to a 2010 United States Department of Transportation report. As of 2007, with 31 destinations in Mexico, the airport offers service to more Mexican destinations than any other United States airport. The Houston Air Route Traffic Control Center, located on the airport grounds at 16600 JFK Boulevard, serves as the region's ARTCC. The HAS administrative offices are also on the airport property. There are three main entrances into IAH's terminal areas. John F. Kennedy Boulevard is the main north-south artery into the airport and intersects with Greens Road becoming an expressway leading to the terminals (by traveling west on Greens Road, one can access the nearby Greenspoint business and residential district). Will Clayton Parkway, which runs east to west, is another main road for IAH. Interstate 69/U.S. Highway 59 (I-69/US 59) is connected to IAH by Will Clayton Parkway. The Hardy Tollway Connector runs from west to east connecting JFK Boulevard to the Hardy Toll Road. The airport has a total of five terminals encompassing 250 acres (1.0 km2), with a 1.5-mile (2.4 km) distance from Terminal A to Terminal D.
Terminal A serves all non-United domestic and Canadian operations, in addition to some United Express domestic operations and international departures. It was one of the original two terminals to open in 1969 and was designed by Goleman & Rolfe and George Pierce-Abel B. Pierce. Like Terminal B, it originally had four circular modules (called "Flight Stations" locally) at the end of corridors radiating out of the corners of the terminal. However, in the late-1990s and early-2000s, the North and South Concourses were rebuilt into linear facilities which provide a smoother operation within the terminal. The project was completed in 2002 and was designed by Gensler. Terminal A has 20 gates, with 10 gates in the North Concourse and 10 gates in the South Concourse. Food and retail areas are located in the center of each concourse. A small United Club is found in the North concourse. It was also one of the original two terminals of the airport to open in 1969 and was also designed by Goleman & Rolfe and George Pierce-Abel B. Pierce. 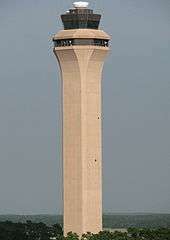 It is mostly an unaltered terminal from its original design and is now used solely by United Express commuter flights. For this reason, the jet bridges are considerably lower to the ground than most others. There are 37 gates and 20 hardstand gates. The terminal underwent minor renovations from 1997 to 2001, designed by Gensler. In 2011 the City of Houston announced that it would demolish the gate areas of Terminal B and rebuild them. The architect for the project is Pierce, Goodwin, Alexander & Linville. The first phase of the terminal's renovation broke ground on January 23, 2012. Phase one of the project was completed in April 2013, and the first 15 gates of the new South Concourse opened for operations on May 21, 2013. The remaining gates have been completed and put in use as of 2014. This brings the total number of gates on the South Concourse to 30 (both types). Terminal C (also known as Lewis W. Cutrer Terminal) serves as United Airlines' main base of domestic operations, plus serves some United Express domestic operations and international departures. It was the third terminal to open at the airport following A and B in 1981. It was designed by the Houston firm of Airport Architects, a joint venture of Golemon & Rolfe Architects and Pierce and Pierce Architects. The airline operate two United Clubs in the terminal - by gate C33 in the South Concourse and by gate C24 in the North Concourse. Terminal C has 31 gates. The terminal includes the airport's interfaith chapel. The terminal underwent renovations from 2000 to 2005 and was designed by Gensler. On May 11, 2015, the airport broke ground on the airport's new Terminal C north concourse, which is expected to be completed in early 2017. Terminal D (also known as Mickey Leland Terminal) serves all non-United international operations, plus some United Express international arrivals. In Terminal D airlines share gates, ticket counters, and terminal equipment, making it a "common use" facility. It is the first "common use facility" to be established in the United States. The Terminal D food court is located in the departures area. In 2007 the airport authority began renovations in which 20 additional common-use ticket counters, upscale retail and restaurant shops, and new on-airport spa/beauty lounge will be added over the next few years. Terminal D has 12 gates and several international lounges, including two separate British Airways Galleries Lounges (First and Club), a KLM Crown, an Air France, and an Executive Lounge for Singapore, Emirates, Qatar, and Lufthansa. On June 18, 2014, Houston City Council unanimously passed a memorandum of agreement establishing plans to demolish the existing Terminal D building and construct a new facility on the same site. Plans call for the terminal to have gates for 15 large wide-body jets, including four Airbus A380 capable gates, as well as a more open design and modern appearance. Construction on Terminal D will not start until the Terminal C North Concourse Project is finished in 2017. Terminal E is IAH's newest terminal. It was designed by Corgan Associates and Spencer Partnership Architects, and it opened in two phases. The first phase opened in 2002 with 14 gates, and the second phase added 16 gates in 2003 for a total of 30. United operates one large, 3-floor United Club in Terminal E, between Gates E11 and E12. Originally Continental (before merging with United) used the terminal solely for domestic flights, but it relocated international operation to the new terminal after the new Federal Inspection Service (FIS) building opened. The terminal was designed for maximum flexibility, with jetways designed to be able to handle any aircraft. Both Air India and the Houston Airport System have announced a proposed flight from Houston to India. Cathay Pacific is interested in starting nonstop flights from Houston to Hong Kong. China Airlines has expressed interest in operating a flight between Taipei and Houston to compete with EVA Air, with Airbus A350-900 equipment, citing the A350's increased cargo capacity as a sign of interest. China Eastern Airlines has recently shown interest in a Shanghai - Houston flight in 2017, as there is a potential market that is currently unserved. Many rumors also speculate a 2017 launch date. Ethiopian Airlines is planning on expanding its U.S. long-haul network as it takes delivery of its new Airbus A350-900 and Boeing 787-8 aircraft. Ethiopian is looking at possible flights to Houston and also to Chicago from Addis Ababa, which could be launched in 2017. Singapore Airlines is considering launching nonstop flights between Houston and Singapore with new Airbus A350-900ULR aircraft. The airline already operates one stop service between Singapore and IAH via Manchester and is also planning on resuming nonstop flights between Singapore and Los Angeles and New York as well as initiating nonstop flights between San Francisco and Singapore with this new ultra long range Airbus aircraft. TAAG Angola Airlines is planning to launch service between Luanda and Houston utilizing Boeing 777 aircraft in order to serve the oil and gas industry. It is part of the airline's five-year recovery plan aimed at improving its negative yearly income situation. TAP Portugal announced they are currently looking at adding flights between Lisbon and ten cities in the U.S. including Houston as IAH is a Star Alliance hub with South and Latin American connections operated by Star Alliance partner United. The TAP service would be flown with Airbus A330 equipment. At the time of the opening of IAH in 1969, domestic scheduled passenger airline service was being operated by American Airlines, Braniff International Airways, Continental Airlines, Delta Air Lines, Eastern Air Lines, National Airlines and Houston-based Texas International Airlines which had formerly operated as Trans-Texas Airways (TTa). International service at this time was being flown by Pan American World Airways (Pan Am) with ten nonstop flights a week operated with Boeing 707 jetliners to Mexico City, KLM Royal Dutch Airlines operating Douglas DC-8 jets four days a week to Amsterdam via an intermediate stop in Montreal, Braniff International with Boeing 727 service several times a week to Panama City, Panama and Aeronaves de Mexico (now Aeroméxico) flying Douglas DC-9 jets to Monterrey, Guadalajara, Puerto Vallarta, Acapulco and Mexico City several days a week. Texas International was also operating direct, no change of plane service to Mexico at this time with Douglas DC-9 jets to Monterrey and Convair 600 turboprop flights to Tampico and Veracruz. KLM Royal Dutch introduced Boeing 747 service in 1971 and by 1974 Air France was operating four nonstop Boeing 747 flights a week to both Paris and Mexico City. Also in 1974, Continental, Pan Am, and National were operating McDonnell Douglas DC-10 wide body jetliners into IAH while Delta was flying Lockheed L-1011 TriStar wide body jets with both types being operated on respective domestic routes from the airport by these airlines with National also operating Boeing 747 service to Houston at this time once a week on a Miami-Houston-Los Angeles routing. By the late 1970s, Cayman Airways had begun nonstop service between Grand Cayman in the Caribbean and Intercontinental with stretched British Aircraft Corporation BAC One-Eleven series 500 twin jets. Cayman Airways served the airport for many years, operating a variety of aircraft including Boeing 727-200, 737-200, 737-300, 737-400 and Douglas DC-8 jetliners into IAH in addition to the BAC One-Eleven. By July 1983, the number of domestic and international air carriers serving Intercontinental had grown substantially. American, Continental, Delta and Eastern had been joined by Piedmont Airlines, Southwest Airlines, TWA, United Airlines, USAir and Western Airlines. Western was operating daily McDonnell Douglas DC-10 wide body jet service nonstop to Salt Lake City at this time with this flight also offering direct one stop service to Anchorage. International service was being operated by Air Canada, Aviateca, British Caledonian Airways, Continental Airlines, Eastern Air Lines, SAHSA, South African Airways, TACA and VIASA in addition to Pan Am, KLM Royal Dutch, Air France, Aeroméxico and Cayman Airways. Several commuter and regional airlines were also operating passenger service at this time from IAH including Emerald Air (operating as Pan Am Express), Metro Airlines, Rio Airways and Royale Airlines. Metro Airlines was operating "cross-town" shuttle service with de Havilland Canada DHC-6 Twin Otter turboprops with up to seventeen round trip flights a day between IAH and the Clear Lake City STOLport located near the NASA Johnson Space Center and also up to nine round trip flights a day between the airport and Sugar Land Regional Airport as well as other flights to regional destinations in Texas and Louisiana. In addition, at this same time the airport had scheduled helicopter airline service operated by Executive Helicopters with Bell 206L "Long Ranger" helicopters to four Houston-area heliports with up to 36 round trip flights a day. Other airlines that previously served Houston Intercontinental in the past were Aviacsa, America West Airlines, Atlantic Southeast Airlines, Canadian Airlines, China Airlines, Comair, Grand Airways, Gulf Air, Martinair, Northwest Airlines, Pakistan International Airlines, PrivatAir operating on behalf of KLM and later SAS, Royal Jordanian (then called ALIA), SeaPort Airlines, South African Airways, Southwest Airlines, UltrAir and World Airways. Atlas Air offers a thrice-weekly Boeing 747-400 scheduled charter service to Luanda, Angola in Africa on behalf of SonAir. Atlas Air replaced World Airways in June 2010 with World having previously operated McDonnell Douglas MD-11 aircraft on the route. These charter flights are intended to service companies operating in the oil industry in Angola which are members of the US/Africa Energy Association (USAEA). EVA Air offers luxury bus service from the Dallas-Fort Worth metro to feed its IAH-TPE route. United Airlines offers thrice-daily bus service to Beaumont, TX, which replaced its air service on July 1, 2012. George Bush Intercontinental ranks as the 12th-largest gateway in the United States in terms of international air cargo moved. The facility moved 389,075 metric tons of cargo in 2010. In January 2003, the Houston Airport System decided to create a new 125 million dollar, 550,000 square feet (51,095 square meters), facility called the George Bush Intercontinental CargoCenter. The facility can handle up to 20 widebody aircraft at one time and has expanded to an operational area of 880,000 sq ft (82,000 m2) over the last five years. The CargoCenter has its own separate Federal Inspection Facitilty (FIS) that houses Customs, United States Citizenship and Immigration Services (USCIS), United States Department of Agriculture, and Animal and Plant Health Inspection Service. The facility also includes the International Air CargoCenter II, a 60,000 sq ft (5,600 m2) perishable cargo handling facility. It is located in the IAH CargoCenter and offer direct ramp access for cargo airlines as well as importers and distributors of perishable goods. The center is recoginized as an official Certified Cargo Screening Facility (CCSF). As of June 2016, AirBridgeCargo Airlines, Cargolux, and Cathay Pacific Cargo serve IAH with late model Boeing 747-8F jumbo jet freighters. For five years in a row, Air Cargo Inc has honored Bush Intercontinental Airport with the ACE Award for Excellence in the category of airports with less than 500,000 tons of air cargo annually. Bush Intercontinental Airport is also frequently visited by Volga Dnepr and Antonov Airlines Antonov An-124 Ruslan aircraft which frequently come in to move heavy oil industry related equipment. Additionally, Volga Dnepr sends the Ilyushin IL-76 for smaller loads. TerminaLink train that runs between terminals. An above ground train called TerminaLink connects Terminals A, B, C, D, E and the International Arrivals Building (IAB) for those with connecting flights in different terminals and provides sterile airside connections. This allows passengers to travel within the airport without having to re-enter security. TerminaLink has four stops: Terminal A, Terminal B, Terminal C, and Terminals D/E including the IAB. The airport has expanded the line to Terminal A at a cost of US $100 million. Construction began on the extension in early 2008 and was completed in 2010. An underground inter-terminal train outside of the sterile zone connects all five terminals and the airport hotel which can be accessed by all. This system is based on the WEDway PeopleMover technology developed by the Walt Disney Company. In addition, United Airlines has started a VIP terminal transportation service for elite status customers, using Mercedes Benz vehicles. The airport houses an on-site hotel, a Marriott, between Terminals B and C and is accessible via the inter-terminal train. The hotel has 566 rooms, two restaurants, a cocktail lounge, a coffee shop and a conference center. The hotel is currently undergoing a total hotel renovation, set to be completed in December 2015. There will be a new lobby, restaurant and bar, and all new sleeping rooms. The former main entrance to the airport. This has since been replaced with a new sign bearing the Houston Airport System Logo. From Downtown Houston one can travel to George Bush Intercontinental by taking Interstate 69/U.S. Route 59 (Eastex Freeway) to Beltway 8 or to Will Clayton Parkway, and access the airport from either road. From Downtown one could also take Interstate 45 (North Freeway), connect to Beltway 8, and enter the airport from the Beltway. The Hardy Toll Road has an exit from the north or south to the airport. The Metropolitan Transit Authority of Harris County, Texas, or METRO, offers bus service available at the south side of Terminal C. The 102 Bush IAH Express serves the airport. Previously, METRO also operated an express bus service known as Airport Direct, launched in the summer of 2008, which traveled from Downtown Houston to Terminal C via the HOV lane of the Eastex Freeway (I-69)/(US 59). In 2010, in an effort to increase ridership and maximize revenue, METRO reduced the fare of Airport Direct and closed a dedicated passenger plaza for the service in Downtown Houston; instead, the bus stopped at several downtown hotels. The fare each way was reduced from $15 to $4.50. The fare change increased ridership levels but decreased cash flow. METRO consistently provided the service at an operational loss. However, in the summer of 2011, METRO announced that it was discontinuing the Airport Direct service, while the Route 102 local service (which serves the greater Greenspoint business and residential district before traveling on I-45 to access downtown) continued to operate. As of 2016 the Taiwanese airline EVA Air operates a shuttle bus service from Bush IAH to Richardson, Texas in the Dallas-Fort Worth area so Dallas-based customers may fly on its services to and from Houston. Previously China Airlines, also a Taiwanese carrier, provided a shuttle bus service to Sugar Land and the Southwest Houston Chinatown. It ended in 2008 when China Airlines ended its Houston passenger service. Courtesy vans are operated by various hotels and motels in and around the Houston Area. There are courtesy telephones in the baggage claim areas to request pick-up for most hotels and motels. Regularly scheduled bus and shuttle service is provided by various carriers to locations from IAH to NRG Park/NRG Astrodome, Downtown Houston, Uptown, Greenway Plaza, the Texas Medical Center, hotels in the Westchase and Energy Corridor business districts, the city of College Station and William P. Hobby Airport. Super Shuttle also provides service from George Bush Intercontinental Airport to the surrounding communities via shared vans. Taxis can be hailed through the Ground Transportation employees outside each terminal. All destinations within Houston's city limits to/from Bush Intercontinental Airport are charged according to the flat Zone Rate or the meter rate. Within a 15-minute cab ride, one can access Deerbrook Mall in Humble and the Greenspoint business district. Within a 45-minute cab ride, one can access the Houston Museum District, The Galleria, and the city arboretum. Taxi drivers at Bush airport wait longer to be dispatched for pickups of passengers than drivers at other airports in major U.S. cities. Josh Harkinson of the Houston Press said "Houston cabbies can easily wait six hours." The lives of many taxi drivers working at the airport revolve around the airport's taxi lot, nicknamed "Cabbieville." Taxi drivers servicing the airport come from many countries around the world. Ed Carpenter's "Light Wings", a multicolored glass sculpture suspended below a sky light, adorns the Terminal A North Concourse. In Terminal A, South Concourse stands Terry Allen's "Countree Music." Allen's piece is a cast bronze tree that plays instrumental music by Joe Ely and David Byrne, though the music is normally turned off. The corridor leading to Terminal A displays Leamon Green's "Passing Through," a 200-foot (61 m) etched glass wall depicting airport travelers. The elevators in Terminal B are cased in stainless steel accordion shaped structures designed by Rachel Hecker. The corridor leading to Terminal B has Dixie Friend Gay's "Houston Bayou." This work is composed of an 8 ft × 75 ft (2.4 m × 22.9 m) Byzantine glass mosaic mural depicting scenes from Houston's bayous and wetlands, several bronze animals embedded in the floor, and five mosaic columns. Lights Spikes Jay Baker, shown in the photo, was created for the 1990 G7 Summit when it was hosted by President George H. W. Bush in Houston. The sculpture was relocated to the airport outside of E Terminal after the meetings from its original location in front of the George R. Brown Convention Center. The distance between each "spike" and this point is relative to the distance between Houston and the capital of the country the flags represent. The countries represented are the United States, the United Kingdom, France, Japan, Canada, Italy and Germany, as well as the European community and the columns lean at a ten-degree angle toward a central point that represents Houston. The airport has a display of lighted modern sculptures between terminals C and D.
The city of Houston presented its master plan update for IAH in 2005. The near-term plan calls for Terminal B's circular flight stations to be rebuilt into linear facilities similar to Terminal A. Construction of a new 155,000-square-foot (14,400 m2) pier at Terminal D, capable of handling six additional wide body aircraft, is slated for completion in 2016. The long-term plans call for the existing unit terminals to be demolished and the North and South Concourses to be linked midway. Soon after, all of the facilities in the North and South Concourses will be linked together to form two long continuous facilities. In addition, a new Central Passenger Processing facility will also be built, called the East Terminal along with an underground people mover. Airfield improvements include a new Runway 8C-26C, a new Runway 9R-27L, a perimeter taxiway, and access roadways. If the FAA selects new sites for runways, the FAA may buy land from the Glen Lee Place and Heather Ridge Village subdivisions, which are located off of Lee Road. 1973: National Airlines Flight 27: Depressurization ejected a passenger after the fan assembly disintegrated en route to McCarran International Airport. 1975: February 1, Douglas DC-3 N15HC of Horizon Properties crashed on approach when the port wing collided with an electricity pylon. The aircraft was on a domestic non-scheduled passenger flight from Lawton Municipal Airport, Oklahoma to Huntsville Regional Airport, Texas. Due to weather conditions, the flight was diverted to Houston. Of the 16 occupants, two crew and three passengers were killed. 1990: Executive/Grumman G1 Operated by Rowan Drilling Company: Power loss in engine after take-off resulted in a failed attempt to regain altitude en route to New Orleans International Airport. The aircraft crashed on departure from Runway 15L and came to rest midfield along a parallel taxiway. There were three fatalities. 1991: Continental Express Flight 2574 (Britt Airways): Broke into pieces en route from Laredo to Houston Intercontinental. There were 14 fatalities. On February 19, 1996, a Continental Airlines McDonnell Douglas DC-9-32 operating as Continental Airlines Flight 1943 from Ronald Reagan National Airport arriving in Houston, Texas landed with its landing gear in the stowed position on Runway 27. The aircraft slid for 6,915 feet (2,108 m) on its belly before coming to a stop on the runway 140 feet (43 m) left of the runway centerline approximately at the departure end of the runway. There were no fatalities and only minor injuries. The aircraft was written off. On December 20, 2008, a Continental Airlines Boeing 737-500 operating as Flight 1404 from Denver International Airport in Denver, Colorado to Bush Airport overran Runway 34R, and caught fire during its takeoff roll. There was no snow or ice on the runway; however, there were 31-knot (36 mph) crosswinds at the time of the accident. On July 13, 2010 the NTSB report stated that the probable cause of this accident was the captain's cessation of right rudder input, which was needed to maintain directional control of the airplane, about 4 seconds before the excursion, when the airplane encountered a strong and gusty crosswind that exceeded the captain's training and experience. Of the 115 people on board, at least 38 sustained injuries, at least two of these were injured critically. ↑ Dwyer-Lindgren, Jeremy (April 24, 2015). "Spirit to Expand Fort Lauderdale, Houston Service". Airways News. Retrieved June 4, 2015. ↑ "Traffic Updates". Houston Airport System. January 2016. Retrieved July 10, 2016. 1 2 3 4 "About George Bush Intercontinental Airport". Fly2Houston.com. Houston Airport System. Retrieved April 28, 2013. ↑ "Airport Fact Sheets, Houston George Bush Intercontinental Airport". United.com. United Airlines. December 1, 2013. Retrieved January 1, 2014. ↑ Lee, Renée C. (October 8, 2006). "Annexed Kingwood Split on Effects". Houston Chronicle. p. A21. Retrieved July 6, 2011. ↑ "History of Hobby". Fly2Houston.com. Houston Airport System. Retrieved April 28, 2013. ↑ "Obituary of Joe Rollins". Houston Chronicle. November 17, 2008. Retrieved November 17, 2008. ↑ "Airport Renamed for Bush". Los Angeles Times. Associated Press. April 18, 1997. Retrieved May 2, 2013. ↑ Bettelheim, Adriel (August 29, 1990). "Houston Gets Continental Hangars. Airline May Shift 1,000 Colo. Jobs to Texas". The Denver Post. Retrieved January 23, 2010. (subscription required (help)). ↑ "Better-Serving the World Since 2005" (Press release). Houston Airport System. January 9, 2007. Archived from the original on November 20, 2008. Retrieved April 28, 2013. ↑ "Continental Flight Powered with biofuel Takes Off". International Herald Tribune. Associated Press. January 7, 2009. Retrieved January 8, 2009. ↑ Porretto, John (January 8, 2009). "Continental Flight Powered with biofuel Takes Off". USA Today. Associated Press. Retrieved August 24, 2015. ↑ Wolff–Sorter, Amy (December 14, 2009). "Council Gives Go Ahead to $50M MXD Plan". ALM Media Properties. Retrieved December 19, 2009. ↑ Moreno, Jenalia (November 15, 2011). "Houston Gets First Scheduled Nonstop Flight to Africa". Houston Chronicle. Retrieved November 16, 2011. ↑ "Worldwide Edition, Official Airline Guide (OAG), Houston (IAH) flight schedules". Departedflights.com. July 1, 1983. Retrieved 2016-06-11. ↑ Schlangenstein, Mary; Credeur, Mary Jane (May 30, 2012). "United to Cut 1,300 Houston Jobs as Southwest Wins New Hub". Bloomberg News. Retrieved April 28, 2013. ↑ Moreno, Jenalia (December 6, 2010). "Continental Will Delay 1st Houston-New Zealand Flight". Houston Chronicle. Retrieved April 28, 2013. ↑ "United Hub - United 787 Dreamliner is back in service - News". United Hub. Retrieved June 4, 2015. ↑ Crocker, Ronnie (December 7, 2011). "Double-Decker Jet to Fly to Houston(City)". Houston Chronicle. Retrieved April 28, 2013. ↑ Collier, Kiah (January 15, 2013). "It's Official: Air China to Begin Flights to Beijing". Houston Chronicle. Retrieved July 1, 2013. ↑ "Houston to Gain New Direct Flights on Turkish Airlines in 2013 to Istanbul" (Press release). Houston Airport System. June 18, 2012. Archived from the original on August 25, 2015. Retrieved July 1, 2013. ↑ Mulvaney, Erin (February 5, 2014). "Korean Air launches nonstop service between Seoul and Houston". Houston Chronicle. Retrieved February 12, 2014. ↑ "Spirit Airlines reports passenger growth of 23% in H1; network grows from 133 to 170 routes, but Cleveland is only new airport". Airline Network News & Analysis. July 28, 2015. Retrieved August 24, 2015. ↑ "Taipei – Houston Route Non-stop flights will enhance Trans-Pacific service network" (Press release). EVA Air. December 8, 2014. Retrieved January 9, 2015. ↑ "HavanaAir Charters and Eastern Air Lines To Start Weekly Air Service to Cuba From Houston International Airport". PR Newswire. July 16, 2015. Retrieved August 24, 2015. ↑ "Air NZ release Houston launch fares from $1400 return". The Timaru Herald. May 20, 2015. Retrieved May 22, 2015. ↑ "2005 Total Airline System Passenger Traffic Up 4.6 Percent From 2004" (Press release). Bureau of Transportation Statistics. April 27, 2006. Retrieved December 30, 2006. ↑ "Master Plan Executive Summary". Fly2Houston.com. Houston Airport System. December 2006. pp. 2–1 (23/130). Archived from the original on July 11, 2011. Retrieved December 14, 2010. ↑ Torbenson, Eric (June 14, 2006). "IAH, Fourth-Fastest Growing Airport in the World". The Dallas Morning News. Archived from the original on February 12, 2012. Retrieved April 28, 2013. ↑ "Best On-Time Performance in the Nation, IAH" (Press release). Houston Airport System. January 2, 2011. Retrieved January 2, 2011. ↑ "Houston Emerges As The Premier Gateway in the U.S. For Travelers To Mexico" (Press release). Houston Airport System. April 12, 2005. Retrieved December 30, 2006. ↑ "Home". Houston Air Route Traffic Control Center. Archived from the original on May 1, 2008. Retrieved July 1, 2013. ↑ "KIAH". Airnav. Retrieved July 1, 2013. 1 2 "Beat Map" (PDF). Houston Police Department. Archived from the original (PDF) on October 8, 2011. Retrieved October 23, 2011. 1 2 3 4 5 6 7 "Terminal Approach" (PDF). March 2010. Retrieved June 11, 2012. ↑ "Profile of a Leading Airport". Houston Airport System. Archived from the original on February 12, 2012. Retrieved April 28, 2013. ↑ "Terminal A Map". Fly2Houston.com. Houston Airport System. Retrieved July 1, 2013. ↑ "Terminal B Map". Fly2Houston.com. Houston Airport System. Retrieved October 2, 2009. ↑ "George Bush IAH Terminal B Southside Replacement". Pierce, Goodwin, Alexander & Linville. Retrieved June 7, 2013. ↑ Moreno, Jenalia (May 23, 2011). "Part of Bush Airport Will Finally Get A Face-Lift". Houston Chronicle. Retrieved August 6, 2011. ↑ "Terminal B South is Open for Business" (Press release). Houston Airport System. June 4, 2013. Retrieved June 7, 2013. ↑ Gonzales, J. R. (November 5, 2007). "A Little on Lewis Cutrer". Houston Chronicle. Retrieved January 17, 2009. ↑ "Terminal C Map". Fly2Houston.com. Houston Airport System. Retrieved January 17, 2009. ↑ "Interfaith Chapels". Fly2Houston.com. Houston Airport System. Retrieved August 25, 2015. ↑ Karp, Gregory (May 13, 2015). "United Airlines announces airport projects". Chicago Tribune. Retrieved June 4, 2015. ↑ "United and Houston Airport System Break Ground on All-New Terminal C North at IAH" (Press release). Houston Airport System. May 11, 2015. Retrieved August 15, 2015. ↑ Holmes, Ann (May 12, 1990). "The Mickey Leland International Airlines Building/Architecture Strives for User Friendliness". Houston Chronicle. Retrieved June 11, 2012. 1 2 3 4 Simons, Janet (October 11, 1992). "Airport Info Houston Intercontinental Airport". Rocky Mountain News. Denver. pp. 5T. Retrieved February 7, 2012. ↑ "Preparing for Emirates". Houston Airport System. Archived from the original on February 12, 2012. Retrieved April 28, 2013. ↑ "Terminal D Map". Fly2Houston.com. Houston Airport System. Retrieved July 1, 2013. ↑ Cooper, Nakia (June 19, 2014). "Houston City Council approves plan for new international terminal at Bush IAH". Click2Houston.com. KPRC-TV. Retrieved August 24, 2015. ↑ "Terminal E Map". Fly2Houston.com. Houston Airport System. Retrieved July 1, 2013. ↑ "United schedules Havana launch in late-Nov 2016". routesonline. Retrieved 2 September 2016. ↑ "Volaris announces new routes to United States (in Spanish)". EnElAire. October 2016. Retrieved October 12, 2016. ↑ "Air India seeks pre clearance to US". 22 November 2015. ↑ "Rio Tinto's new long-haul routes, Cathay Pacific intends to fly to Hawaii Tel Aviv Madrid". 29 September 2015. ↑ "China Airlines outlines A350-900XWB entry to service plan". Routesonline. Retrieved 2016-06-11. ↑ "Ethiopian Airlines plans to expand flights to U.S.". 21 October 2015. Retrieved 14 November 2015. ↑ "Singapore Airlines to resume non-stop US services with A350-900ULR: a strategic imperative | CAPA". Centre for Aviation. Retrieved 2016-06-11. ↑ "TAAG Angola to take heavy cuts as oil slump hits home". 30 November 2015. ↑ "Pan American World Airways system timetables". June 1, 1969. Retrieved August 24, 2015. ↑ "Braniff International Airways system timetables". March 15, 1969. Retrieved August 24, 2015. ↑ "KLM Royal Dutch Airlines system timetable". June 15, 1969. Retrieved August 24, 2015. ↑ "Aeronaves de Mexico system timetable". June 1, 1969. Retrieved August 24, 2015. ↑ "Texas International Airlines system timetable". July 1, 1970. Retrieved August 24, 2015. ↑ "KLM Royal Dutch Airlines system timetable". May 15, 1971. Retrieved August 24, 2015. ↑ "Air France system timetable". April 1, 1974. Retrieved August 24, 2015. ↑ "Official Airline Guide (OAG), Houston (IAH) flight schedules". April 1, 1974. Retrieved August 25, 2015. ↑ "Cayman Airways system timetable". December 15, 1979. Retrieved August 24, 2015. ↑ "Official Airline Guide (OAG) editions, Houston (IAH) flight schedules". Deaprtedflights.com. Retrieved 2016-06-11. 1 2 3 4 "Official Airline Guide (OAG), Houston (IAH) flight schedules". July 1, 1983. Retrieved August 25, 2015. ↑ "Official Airline Guide (OAG)". Departedflights.com. July 1, 1983. Retrieved 2016-06-11. ↑ "International Official Airline Guide (OAG), Houston (IAH) flight schedules". July 1, 1983. Retrieved August 25, 2015. ↑ "Consorcio Aviacsa, S.A. de C.V. – FREE Consorcio Aviacsa, S.A. de C.V. information - Encyclopedia.com: Find Consorcio Aviacsa, S.A. de C.V. research". Retrieved June 11, 2016. ↑ "America West Airlines". World Airline News. Retrieved 2016-06-11. ↑ EDWARD HEGSTROM, Copyright 2004 Houston Chronicle (2004-05-10). "The World in Houston: Quarantine facility considered - Houston Chronicle". Chron.com. Retrieved 2016-06-11. ↑ "Texas Monthly - Google Books". Books.google.com. Retrieved 2016-06-11. ↑ Drum, Bruce (June 2, 2010). "Atlas Air Starts the "Houston Express"". Seattle Post-Intelligencer. Retrieved June 2, 2010. ↑ "Houston Express". SonAir. November 6, 2000. Archived from the original on March 15, 2013. Retrieved April 28, 2013. ↑ "Free Shuttle Service to Connect Dallas and Houston - EVA Air | America". EVA Air. 2016-05-10. Retrieved 2016-06-11. ↑ "Air Cargo". Fly2Houston.com. Houston Airport System. Retrieved July 1, 2013. ↑ "A Jewel for Cargo Handlers Far and Wide" (Press release). Houston Airport System. September 12, 2006. Archived from the original on December 17, 2010. Retrieved April 28, 2013. ↑ "Houston Launches New Air Cargo Facility at Intercontinental Airport for Perishable Imports" (Press release). Houston Airport System. PR Newswire. August 18, 2009. Retrieved July 1, 2013. ↑ "Houston Gains New Air Cargo Status" (Press release). Houston Airport System. April 25, 2010. Archived from the original on February 22, 2012. Retrieved April 28, 2013. ↑ "The Cargo Operation at IAH Continues to Receive Worldwide Acclaim" (Press release). Houston Airport System. March 16, 2009. Archived from the original on March 23, 2009. Retrieved April 28, 2013. ↑ "International Air Cargo by Region". City of Houston. Retrieved August 14, 2008. ↑ "BTS Air Carriers : T-100 International Market (All Carriers)". Retrieved June 16, 2016. ↑ "Houston Airport System: Rules & Policies". Fly2houston.com. Retrieved 2016-06-11. ↑ "$1.2 Billion in Improvements for Houston's George Bush Intercontinental Airport" (Press release). Houston Airport System. April 7, 2008. Archived from the original on December 24, 2008. Retrieved April 28, 2013. ↑ "Non–Secure Inter–Terminal Passenger Conveyance Alternatives" (PDF). Lea Elliot, Inc. Retrieved July 1, 2013. ↑ Kenison, Melissa (July 17, 2013). "United Airlines offers new luxury on the ground". WSCH-TV. KPRC-TV. Retrieved July 18, 2013. ↑ "Houston Airport Marriott at George Bush Intercontinental". Marriott. Retrieved August 24, 2015. ↑ Feser, Katherine (March 2, 2015). "Houston Airport Marriott lands a makeover". Houston Chronicle. Retrieved 13 March 2015. 1 2 3 4 "Ground Transportation". Fly2Houston.com. Houston Airport System. Retrieved April 28, 2013. ↑ "Use METRO's Airport Direct to Get to/from Houston Intercontinental Airport". Continental Airlines. Archived from the original on March 8, 2009. Retrieved January 12, 2009. ↑ "102 Bush IAH Express" (PDF). RideMetro.org. Metropolitan Transit Authority of Harris County, Texas. August 17, 2015. Retrieved August 25, 2015. ↑ Moran, Chris (December 6, 2010). "Metro Cuts Fare and Reroutes Shuttle to IAH". Houston Chronicle. Retrieved December 7, 2010. ↑ Christian, Carol (June 6, 2011). "Metro Airport Link Gets Riders, but Not Revenue". Houston Chronicle. Retrieved June 6, 2011. ↑ Christian, Carol (July 26, 2011). "Metro Moves to Eliminate Airport Direct Service". Houston Chronicle. Retrieved July 26, 2011. ↑ "Dallas – Houston – Dallas Free Shuttle Service Schedule." EVA Air. Retrieved on February 29, 2016. ↑ Hensel, Bill, Jr. "2 foreign airlines curtailing Houston passenger service." Houston Chronicle. January 11, 2008. Retrieved on November 20, 2012. ↑ Harkinson, Josh (September 22, 2005). "Cabbieville". Houston Press. Retrieved October 8, 2009. ↑ "Portfolio:North Concourse Sculpture" (Press release). Ed Carpenter. June 1, 2001. Retrieved December 30, 2006. ↑ "George Bush Intercontinental Airport Renovation" (Press release). Houston Arts Alliance. June 1, 2001. Retrieved December 30, 2006. ↑ "Airport Art". Fly2Houston.com. Houston Airport System. Retrieved April 28, 2013. ↑ "Houston Airport System, Master Plan". Fly2Houston.com. Houston Airport System. Archived from the original on September 13, 2008. Retrieved September 27, 2008. ↑ "Ongoing Capital Improvement Projects". Fly2Houston.com. Houston Airport System. Retrieved April 28, 2013. ↑ Lee, Renée C. (May 13, 2009). "IAH Runway Expansion Has Neighbors Fretting Over Moving". Houston Chronicle. Retrieved April 28, 2013. ↑ "IAH Environmental Impact Study". IAH Environmental Impact Study. Retrieved July 1, 2013. ↑ Lee, Renée C. (May 13, 2009). "Living in the Way of the Runway". Houston Chronicle. Retrieved May 14, 2009. ↑ "ASN Aircraft accident McDonnell Douglas DC-10-10 N60NA Socorro, NM". Aviation Safety Network. November 3, 1973. Retrieved April 28, 2013. ↑ "Accident description". Aviation Safety Network. Retrieved August 19, 2010. ↑ "Flight International". Flight Global. April 24, 1976. p. 1090. Retrieved April 28, 2013. ↑ "ASN Aircraft accident Grumman G-159 Gulfstream I N80RD Houston-Intercontinental Airport, TX (IAH)". Aviation Safety Network. August 23, 1990. Retrieved April 28, 2013. ↑ "ASN Aircraft accident Embraer 120RT Brasilia N33701 Eagle Lake, TX". Aviation Safety Network. September 11, 1991. Retrieved April 28, 2013. ↑ "ASN Aircraft accident McDonnell Douglas DC-9-32 N10556 Houston-Intercontinental Airport, TX (IAH)". Aviation Safety Network. February 19, 1996. Retrieved April 28, 2013. ↑ Simpson, Kevin; Bunch, Joey; Pankratz, Howard (December 21, 2008). "DIA Accident Injures 38". The Denver Post. Retrieved July 1, 2013. ↑ Boniface, Dan; Wolf, Jeffrey (December 21, 2008). "Continental Flight Slides Off Runway; Dozens Injured". KUSA (TV). Denver. Retrieved December 21, 2008. ↑ Boniface, Dan; Wolf, Jeffrey (December 21, 2008). "NTSB Begins Investigation into Why Plane Slid Off Runway". KUSA (TV). Denver. Retrieved December 21, 2008. ↑ Lendon, Brad (May 3, 2013). "Houston airport shooter killed self, police say". CNN. Retrieved June 4, 2015.